Is your team in sync? How would you rate your team’s communication? Triangulation impairs progress, decreases morale and creates division. Groups become divided. Trust erodes, production suffers, conflict increases, and creativity may be blunted as communication dynamics worsen. Team Member 1 (TM1) and 2 have a conflict. •	TM1 goes to TM3 to talk about TM2. •	TM2 isn’t in the loop and consequently, isn’t aware of the TM1 to TM3 interaction. •	When TM2 gets wind of this, he/she feels blindsided, resentful and mistrustful. •	Communication Challenge is Magnified! Yet, there are simple steps team leaders can take to immediately impact their team’s communication challenges! 1) Create awareness of triangulation within your team. a) Step 1: I agree to resolve issues directly with source of the challenge. b) Step 2: I agree I will not talk in a negative fashion about my colleague behind their back. c) Step 3: If I’m unable to resolve the conflict with the individual, I will seek a neutral mentor or 3rd party to coach me through the conflict or ask for mediation. d) Step 4: For steps 1 – 3, I will be accountable and actionable throughout the process. Most of us have experienced team synchronicity. Most of us have experienced triangulation. By following a few simple steps, your team will make giant leaps! When discussing leadership characteristics, the phrase “calm under pressure” is commonly mentioned. The vision of the leader calming the employees during challenging times. The general in the field, unflinchingly leading the troops through battle. The CEO talking to the press about reorganization and future growth. The leader reassures the company the upcoming product launch will happen on time. The leader talking to the company about a recent tragedy and assuring the employees she is there with them. Often, this is true. And, frequently, this couldn’t be farther from the truth because of family gatherings, deadlines for year-end projects, too much food and drinks, money spent and the re-evaluation of our earnings, etc. Let’s look at the stress of the Fall season on a continuum – scale of 1-10. Where do you see yourself now? What about in 2 weeks? Scale yourself between 1 – 10 right now. Do it in two weeks and commit to a mid-January stress evaluation. Want to lead by example through the holiday and feel emboldened and energized? Below is stress research and time-tested stress busters? We can choose to manage our stress by focusing on our internal reactions to external happenings around us. Are you up for the challenge? In this article, we’ll look at what stress is, what increases your risk of experiencing it, and how you can manage it, so that it doesn’t affect your well-being and productivity. While the stress management techniques in this article can have a positive effect on reducing stress, they are for guidance only. You should take the advice of a suitably qualified health professional if you have any concerns over stress-related illnesses, or if you are experiencing significant or persistent unhappiness. We have two instinctive reactions that make up our stress response. These are the “fight or flight” response, and the General Adaptation Syndrome (GAS). Both of these reactions can happen at the same time. In these types of situations, a calm, rational, controlled, and socially sensitive approach is often more appropriate. GAS, which Hans Selye identified in 1950, is a response to long-term exposure to stress. The alarm phase, where we react to the stressor. The resistance phase, where we adapt to, and cope with, the stressor. The body can’t keep up resistance indefinitely, so our physical and emotional resources are gradually depleted. The exhaustion phase, where, eventually, we’re “worn down” and we cannot function normally. Fight or flight and GAS are actually linked – the exhaustion phase of GAS comes from an accumulation of very many fight or flight responses, over a long period of time. When we encounter a situation, we make two (often unconscious) judgments. First, we decide whether the situation is threatening – this could be a threat to our social standing, values, time, or reputation, as well as to our survival. This can then trigger the fight or flight response, and the alarm phase of GAB. Next, we judge whether we have the resources to meet the perceived threat. These resources can include time, knowledge, emotional capabilities, energy, strength, and much more. How stressed we feel then depends on how far out of control we feel, and how well we can meet the threat with the resources we have available. Stress impacts our ability to do our jobs effectively, and it affects how we work with other people. This can have a serious impact on our careers, and well as on our general well-being and relationships. Next, list these stressors in order of their impact. Which affect your health and well-being most? And which affect your work and productivity? Your workload can cause stress, if you don’t manage your time well. This can be a key source of stress for very many people. 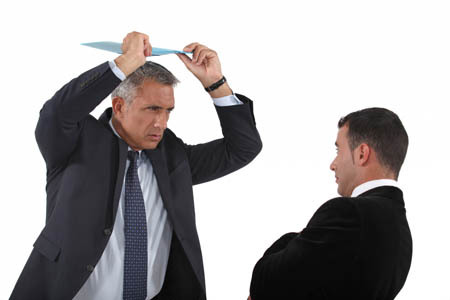 Practice assertiveness; manage your boundaries especially dealing with unreasonable requests during the holidays! Use Cognitive Restructuring: Remember our beliefs = our behavior. Change your beliefs to minimize unhealthy responses to stress. Reframe uncomfortable situations. Focus on a positive outlook or belief. Take advantage of your support network – this could include your friends and family, as well as people at work and professional providers, such as counselors or family doctors. Get enough exercise and sleep, and learn how to make the most of your down, so that you can recover from stressful events. We experience stress when we feel threatened, and when we believe that we don’t have the resources to deal with a challenging situation. Over time, this can cause long-term health problems; and it can also affect the quality of our work and our productivity. To control your stress, conduct a job analysis, so that you know your most important priorities at work. Learn good time management strategies, so that you can handle your priorities effectively. Try to let go of negative thinking habits, and become a positive thinker by using affirmations and visualization. Also, create defenses against stressful situations that you cannot control – use your network, be sure to get enough exercise and sleep, and learn how to relax. The holiday season is here. We have the understanding, tools and strategies to manage stress. Are you up for the challenge? Let us know your thoughts and strategies for managing stress through the holiday season. You’ve had a great weekend and getting back to work doesn’t seem so bad this week. Traffic is heavy yet it’s moving at a steady pace. You make a few calls on the way to work. You pull into the office parking lot and your ready to go. Change “project” to any of your responsibilities at work. Change “deadline” to any thing else important that is fitting for you job. One thing we can’t change is the unprovoked attack by a person who has no sense of the impact of their actions on us. They have no sense of the impact on morale around us. Or, they do understand the consequences of this behavior and choose not to care in that moment. While bullying behavior is derailing for most, it doesn’t have to be. Over the next few months we will be talking about resolving conflicts with difficult people. Practice: Rehearsing our response and the potential excuses, blame and minimization by the bully are important for two reasons. We are specific and to the point about how this person’s behavior is inappropriate.And two, we know what potential responses to expect. Becoming fearless when it comes to conflict helps create a more effective workplace as problems are addressed as they arise.Also, bullying behavior that is not addressed opens up the door for a cascade of problems down the line. Please send your responses and thoughts. We would like to hear about your most challenging work situation with a difficult person and may use it as an example in our next newsletter.